(Nanowerk News) Researchers at Chalmers University of Technology have discovered that a certain bed material improves the combustion efficiency of waste and biomass while decreasing operating and maintenance costs significantly. In collaboration with the energy supplier Eon, the researchers have proven the concept in today’s commercial boilers. The findings make combined heat and power (CHP) technology highly interesting both from a profit and a climate perspective, and open up for smarter next generation designs. The discovery of how metal oxides’ oxygen-carrying properties can be used in circulating fluidised bed (CFB) boilers has been verified and scaled up from the lab to commercial reality within record time. During last winter, from November 2014 to May 2015, researchers at Chalmers University of Technology and Eon personnel have conducted long-term testing with a new bed material in a state-of-the-art combined heat and power (CHP) plant, Händelöverket in Norrköping. In one of the plant’s five boilers, P14, a 75 MW CFB boiler, the silica sand normally used was replaced with an ilmenite-based bed material. Bed material in the form of sand is used to even out heat fluctuations and make the combustion of the fuel more efficient. 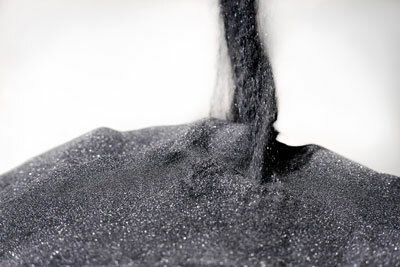 The iron-titanium mineral ilmenite and other metal oxides have a clear advantage compared to regular sand: they can transport oxygen inside the combustion chamber from places where there is an abundance of oxygen to places where there is a depletion in oxygen. When oxygen-carrying bed material is circulated inside the chamber mixing with the fuel, the oxygen is distributed evenly in time and space. “This brings forth an array of positive effects, which testing completed in Norrköping confirms. The combustion becomes more uniform and efficient. The boiler’s total efficiency increases. The emission of carbon monoxide is lowered radically, as are problem related to ash fouling,” says Fredrik Lind, PhD at the Department of Energy and Environment and project coordinator at Chalmers University of Technology. “We are now sure that we are able to significantly lower the operational and maintenance costs in most of the thousands of fluidised bed combustor plants that are currently in use internationally,” he says. It is too early to speculate in the exact gains but it is clear that the profit margin of each CHP boiler will improve significantly. Eon is hoping to start using the new ilmenite-based bed material in two boilers in Norrköping this year, and have several other plants in line. Eon will also use its gathered experience to start offering a service concept that enables a transition to the new bed material. “This is the biggest improvement I have experienced. A little like placing a turbo charge to the process,” says Bengt-Åke Andersson, Adjunct Professor in combustion technology and Senior Specialist at Eon, who has worked with fluidising bed technology for a long time. “One of the advantages is that it enables the burning of difficult fuels like coarse waste. This could become crucial in the future, if we are to meet our climate goals,” Fredrik Lind adds. The idea, to test metal oxides as bed material, Professor Henrik Thunman got from another project where ilmenite was used as a catalyst to clean gas from tar in the biomass gasifier at Chalmers University of Technology. All of a sudden, he found himself with a solution for a problem that had eluded researchers and boiler producers for a long time: How to avoid unburned fuel in a commercial boiler? The first scientific results were published in June 2013. Since then, the research has sped ahead toward being implemented in a real application. “This shows the importance of having a critical mass of researchers and quickly being able to scale up basic and applied results. The concept is an offshoot from more than one hundred man years of research combined with the experiences we have built up under more than 10-15 years within energy technology,” Henrik Thunman says. Last winter’s full-scale trial is the last in a long run of tests that have taken place over a period of two-three years, first in the Chalmers Power Plant, and from 2014 paralleled in Eon’s commercial plant. A key success factor is the fact that the Chalmers Power Plant contains the world’s largest research boiler. Another critical factor is this type of industry academy collaboration, which Chalmers and Eon have pioneered since 2007. As of today, Chalmers University of Technology collaborates with more than ten other global companies in similar manners. Eon confirms this picture: “The knowledge developed in cooperation between Chalmers University of Technology and Eon is fostered by many years of research. Without this on-going close contact and Chalmers University of Technology’s fundamental understanding of industry needs, we would not be where we are today. Bringing along experience built up throughout the years, Eon now takes the leap from successful research to commercialisation, giving the market access to a solution that not only favours the environment but also the economy,” says Fredrik Rosenqvist, Head of Business Innovation at Eon Sverige. The results of the full-scale trials will be published scientifically before long. The Chalmers Power Plant has the world’s largest boiler for research purposes, a 14-meter high 12 MW CFB boiler. It is basically an industrial-sized boiler, that you may open on different spots for samples of the hearth for chemical analysis. In addition to acting as a laboratory, it produces enough power, on an annual basis, to supply the campus at Johanneberg in Gothenburg with heat. The boiler is operated by Akademiska hus in cooperation with Göteborg Energi. The main incentive for Göteborg Energi is to enable research support to the Gobigas project at Hising Island, where Göteborg Energi are producing biogas directly from solid biomass. In circulating fluidised bed (CFB) boilers, a hot desert storm of fuel and bed material measuring 850 °C is created through injecting combustion air from below. The solid particles assume a liquid-like state and completely fill the combustion chamber. Particles that reach the top are separated in the cyclone, and are recovered from the flue gas on the way down, again to be returned to the bottom of the boiler. The bed material distributes the heat evenly and works much like hot stones in a fireplace. This type of boiler is common in modern combined heat and power plants that use various forms of biofuels. A rule of thumb says that 6 kg of silica sand is required per MWh produced. A typical commercial 100 MW boiler expends 10-15 tonnes of sand per day, usually added to landfills after use. "Using an oxygen-carrier as bed material for combustion of biomass in a 12-MWth circulating fluidized-bed boiler"; Fuel (0016-2361). Vol. 113 (2013), p. 300-309. "Ash Properties of Ilmenite Used as Bed Material for Combustion of Biomass in a Circulating Fluidized Bed Boiler"; Energy & Fuels (0887-0624). Vol. 28 (2014), 12, p. 7672-7679.